I know that most of us as Android elitists aren’t fans of Amazon’s implementation of “Android” on tablets and phones, but that doesn’t mean some of their other offerings, like the Amazon Echo and handful of Fire TV products aren’t solid and completely worth having in your home. 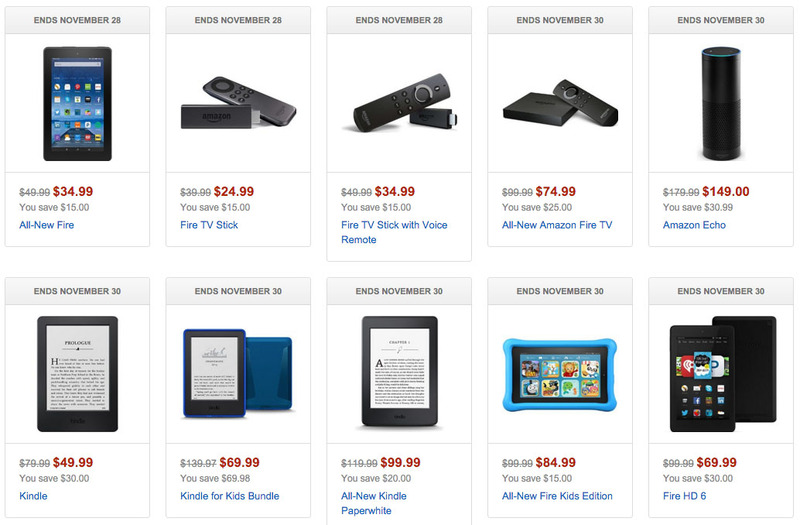 For Black Friday, Amazon is discounting all of their Amazon devices like the Echo and Fire TV line-up. They are also discounting all of their tablets and e-readers as well, in case those are of interest. The Amazon Echo, which is Amazon’s assistant/speaker/cool-looking-tube, has been discounted by $31 to $149. Their Fire TV products are also seeing nice price cuts. The Fire TV stick (without voice remote) is down to $24.99, but you can grab the version with a voice remote for $10 extra at $34.99. If you want something a bit more high-powered, the regular Fire TV box is down to $74.99 ($25 discount).